This is a run up to the Mönchsberg, one of the 5 mountains in Salzburg, whose summit is at 500 meters. 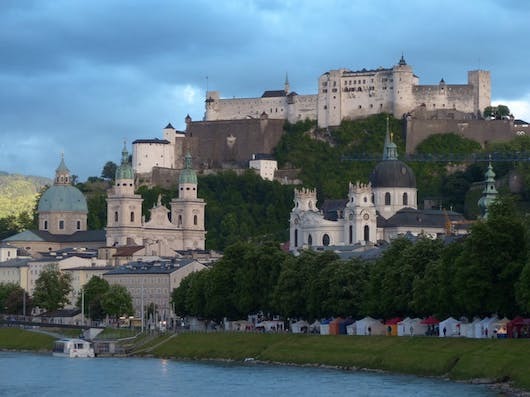 There’s a pedestrian path that climbs for nearly 3 km to the Hohensalzburg — a huge 11th-century fortress complex on a hilltop with great views.Our 6.5 km route also includes some of Salzburg’s architectural and cultural highlights. The path starts near the river and the Hospital complex. Follow the path, with a slight detour around the Bürgerwehr Mönchsberg. You’ll pass by several museums and the performing arts complex. Pop up to the viewpoint and then enjoy the Fortress, before continuing along the Festungsgasse to the Stift Nonnberg, a convent church consecrated in 1099. Just past the church, LEFT on Nonnbergstiege, which turns into Kaigasse, and passes the Panorama Museum and several iconic Salzburg sights along Mozartplatz: the Salzburg Museum, Mozartplatz, Residenzplatz. Just past the 4km mark, RIGHT on Sigmund-Haffner Gasse, and then your first LEF, passing Old City Hall and Mozart’s Birthplace. At the Toy Museum and area with two old churches, RIGHT on Griesgasse for a quick jaunt over the Makartsteg Bridge. You’ll then enjoy a lovely 1 km through the Mozart University, residence complex, and the beautiful grounds of the Mirabellgarten and Palace. Cross back over the Müllner Steg bridge to the starting point.